Even as seas rise against the shores, another great tide is beginning to rise — a tide of outrage against the pillage of the planet, a tide of commitment to justice and human rights, a swelling affirmation of moral responsibility to the future and to Earth's fullness of life. » Check out Kathleen's Enumeration essay in ORION Magazine. » Hear Kathleen speak about fracking and human rights in Miranda Perrone’s podcast for Terrain.org here. » Kathleen will read two essays during the Amadeus Chamber Orchestra’s celebration of the wild earth in Portland on March 8th. The concert features the premiere of Adam LaMotte’s “Call to Forgiveness,” a piece for orchestra and piccolo, inspired by Kathleen’s essay in Great Tide Rising. Click here for a preview. » Now you can hear Kathleen and Sue Ellen Campbell read their essay, “Why We Won’t Quit the Climate Fight” on EcoShock radio here. » Earth Island Journal has reprinted Kathleen’s “Posthumous Interview with Edward Abbey” from Great Tide Rising. He’s still the funniest and most outrageous truth-teller in the desert: www.earthisland.org/. » Kathleen and her dear writer friend SueEllen Campbell sat down at the beach and asked themselves, "Why do we keep trying so hard on climate change?" Here is their answer. » LitHub lists Great Tide Rising as one of the six essential climate books written by women, along with The Sixth Extinction and Field Notes from a Catastrophe. » You can hear Kathleen talk about her Climate Defender’s Calendar, the tongue-in-cheek Twelve-Year Plan to save the planet on KZFR radio here. » Great Tide Rising is listed as one of thirteen climate grief-healing books in the Vox article "See Something, Learn Something, Do Something: A Care Package for Climate Grief". » Kathleen will be signing books at the Wild Arts Festival in Portland on November 18, from noon to 4:00. This is a benefit for the Audubon Society, so come on over! » The respected philosophy journal, Environmental Ethics, recommends Piano Tide for environmental ethics and environmental literature courses. Click here to read the review. » Hear Kathleen deliver a sermon (!) on the moral urgency of climate action. It starts after the bell choir at 4:30 here. » John Shuck interviews Kathleen for Pacifica Radio. » Hear Kathleen speak for hope and for the future in Suez Jacobson’s new film, Wild Hope. Click here for the video. » Earth Island Journal asked Kathleen to write for their special issue on women and the environment. Here’s her impassioned essay, "Be the Hummingbird. Be the Bear." » Read Dan Bloom’s lively interview with Kathleen about Piano Tide on the Burning Embers Cli-Fi website. 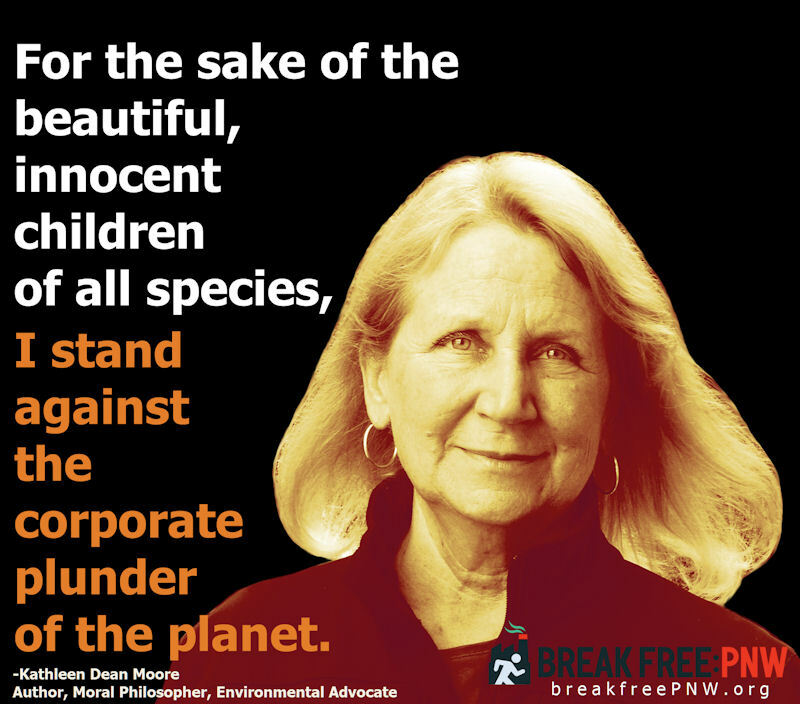 » Kathleen's closing address for the Tribunal on Fracking, Climate Change, and Human Rights is now available on her YouTube channel. » Valorie Grace Hallinan has posted a review of Great Tide Rising on her “Books can save a life” blog. It’s such a perceptive review that I turn to it when my own writing compass goes awry. I hope you have a chance to read it. Filled with music, rainwater, wildlife, and some of the oddest and most affable characters along this far shore, "Piano Tide" weaves together the fecundity of the tides with a fiercely witty and deeply spirited story about the striving of all creatures for an enduring way of life. 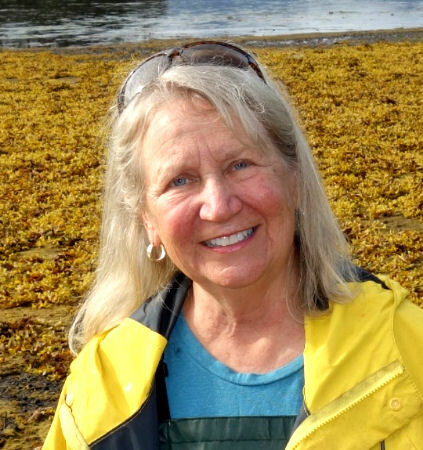 "In Piano Tide, Kathleen Dean Moore has given us an action adventure, a lesson in the natural history of Southeast Alaska, and a cast of unforgettable backwoods characters. As Pacific tides rise and fall, almost engulfing the hamlet called Good River Harbor, we witness humans as well as bears, salmon, and the forest itself, fighting to survive amid forces of man-made destruction and nature’s renewal. Piano Tide is a fine rad, sure to join the ranks of Ed Abbey’s Monkey Wrench Gang on the eco-thriller bookshelf." Even as seas rise against the shores, another great tide is beginning to rise – a tide of outrage against the pillage of the planet, a tide of commitment to justice and human rights, a swelling affirmation of moral responsibility to the future and to Earth’s fullness of life. "In this probing and lyrical book, Moore reminds readers of the inter-relatedness of all living things through time, and she offers a clarion call to summon the moral courage to 'rage against the dying' of the Earth. An impassioned and well-reasoned cry for 'great rising tides of affirmation of justice and human decency and shared thriving.'" Although climate destabilization is a scientific and technical issue, it is primarily a moral issue. MORAL GROUND gathers the testimony of one hundred of the world’s moral leaders, all calling us to honor our responsibilities to the future. "Could there be a more pressing book topic than the fate of humanity?" With stories about kayaking in a snowstorm, wading among salmon in the dark, and cooking breakfast in the desert, Moore offers readers a profound meditation on the healing power of nature. "In its grounded wisdoms, humility, curiosity, and in the kaleidoscope beauty of its descriptions, Wild Comfort reminds how to see, how to sing; how to welcome, with equal gravity and grace, whatever asks entrance into our lives. It is destined to become a classic."